JS2k.com introduces Quality LED lighting for the S2000 community! Modernize your car with LEDs! Brighter, true white color, less energy consumption, longer lasting, instant on. Why buy LEDs from JS2k.com? We manufacture all our LEDs, and don't just buy the cheap crap like on eBay. Quality - Almost all LEDs (plug&play) are manufactured in China, yet some fail and die within a week, (AHEM EBAY). It is up to the vendor to source, test, and commission quality LEDs. I've done all the legwork, in manufacturing only the best and brightest LEDs for any application, so you don't learn a lesson the hard way. Color - Our white LEDs are 100% pure white. There is no 'ricey looking' blue tint (AHEM EBAY) or purple or yellow in any of our LEDs. The result is a crisp, modern, classy light output. Service - Having a problem? Have a question? Just let me know. I'll do whatever I can to help. Warranty - LEDs do die. Manufacturing defects do exist. Heat, moisture, vibration can all break a LED. If this happens, let us know. Pics - You'll notice that my pics don't look as bright as most other sellers. This is because I portray the LEDs as closely to real life as possible. Most LED sellers crank up the brightness to make their LEDs look bright. The Turn Signal, Brake, and Reverse LEDs have all received brightness upgrades! Added a Turn Signal Package for AP1s and AP2s for easier checkout. Added hyperblink fixes as well! This LED package has over 4x as many LEDs as the standard LED conversion for a total of 18 LEDs! Multiply that by 2 (2 dome light bulbs) and that's 36 LEDs! The comparison picture really shows how dramatically different the light output is. 1 order comes with 2 bulbs for both dome lights. This LED package consists of a total of 24 LEDs, compared to the 5 LEDs in the standard LED conversion. These LEDs are spread out along the entire trunk, and light up every inch of it! For more pics, click Show Spoiler. Give your headlights a more attractive color with these colored bulbs. These are almost as bright as stock. Any colored HID bulb will diminish light output as you go higher in Kelvin. This is why I only sell up to 6000K bulbs, which only has a very slightly diminished light output. This adds a tiny tinge of blue without the 'ricey' look. Have your HIDs gone out? The HID bulb is usually the first failure point in the HID system, and the cheapest to replace. Finally, I've found a LED that is brighter than stock! Fully plug and play, instant on, deep red color (instead of a reddish-orange), brighter than stock! Left is LED, right is incandescent. Check out the video to see how fast they light up! I carry Turn Signal LEDs now!!!! ONLY because they're bright enough to be safe to use. I've been selling LEDs for S2000s since 2009, and only recently have Plug-and-Play LEDs become bright enough for me to offer them to you (it's a principle thing). Notice that I show different angles, that are all equally bright. Lots of LEDs don't have the spread that mine do, of course, not to mention the brightness. Lights up the footwells to make entry into your S more of a pleasure. Comes with wiring diagram to wire the LEDs. Off - Lock on remote, Closed door. You will need to purchase a relay, copper wire, and a switch to wire these. LED High Beam / DRL LEDs - 00-05 S2000s function as high beams only, but 06+ use the high beams also as a daytime running light. Get LEDs for these applications for increased brightness and instant on and off when flashing your brights. For 06+, you'll achieve a much cleaner looking DRL output. Link to JS2k.com: Supernova LED High Beam / DRL Bulbs (Pair) - $59.99 : JS2K.com! LED Underglows - Underglows are coming back! Get a set of App Controlled Color Changing Underglows for your ride. Link to JS2k.com: App Controlled Underglow LED kit - $69.99 : JS2K.com! App Controlled Footwell / Engine Bay Lights - Illuminate your footwells or in your engine bay with this kit. Control the lights and patterns with your phone. Link to JS2k.com: App Controlled Color Changing LED Footwell Lights - $39.99 : JS2K.com! LED Diffusion Film- If you don't like seeing individual LEDs, put the diffusion film inside the housing and you'll get a more even and diffused light. Link to JS2k.com: LED Diffusion Film - $9.99 : JS2K.com! Problem: When you just simply replace your halogen high beam bulbs with LEDs on S2000s with DRLs (06+ and all year Canadian S2000s), the high beams work, but the DRLs flicker instead of being dimmed. Who: JS2k / Supernova LEDs have been manufacturing only the highest quality LEDs for car enthusiasts since 2008. Why: The OEM DRL module pulsates voltage very quickly to achieve the 'dimmed' state. With the OEM halogen bulbs, the average voltage is lower, and the light output is lower. With LED bulbs, they are either on or off, so this type of voltage will cause LED bulbs to strobe or flicker. (4) Override #3 above, and turn on when you activate the high beams with the low beams on. Bonus: a bonus to #2 above, the DRL / High Beams will stay on for 15 seconds after you turn off the car. We are able to achieve all of these results from a custom harness built specifically for the S2000 after quite a lot of calculations, trial and error, and designs. There are multiple components that are all wired together to ensure all of the above functionality works for all S2000s whether you have DRLs or not. Instead of fixing the issue with using LEDs on the factory DRL module, our custom harness bypasses the factory DRLs altogether while retaining all the functionality. Our LED headlight bulbs for the High Beam / DRL, use only the best quality LED chips that are much brighter than stock. Not only are they brighter, they are farther reaching, and have a much better color temperature. They are a pure white with the smallest tinge of blue, not a ricey blue. LED are PERFECT for the High Beam application because they are instant on / instant off for flashing to pass or signaling other drivers. Because the S2000 headlights have a rubber grommet in the back, we will include our EasySeal to ensure you don't have to cut up your grommet to get these LEDs to fit. Our EasySeal will keep dust and water out of your headlights. The S2000 headlights also have a unique mounting clip and most LEDs do not include this adapter. Other LEDs will spin and rattle inside your headlights. Our LEDs will not. Q: Are the DRLs too bright? A: These are brighter than most other DRLs, but because there is much more ambient lighting, when used in a daytime environment they are not dangerous nor blinding to other drivers. Q: How difficult is installation? A: Not a particularly difficult install. We've gone out of our way to build a complete kit. You will need basic knowledge and how to follow instructions. If you can build LEGOs or Ikea furniture, you'll be fine. Q: How invasive is the installation? A: Only the low beams need to be spliced. We provide Easy T-Taps to cleanly and easily splice the wires without ruining them. The installation is reversible and removable. Q: Does this work if I don't have DRLs now? 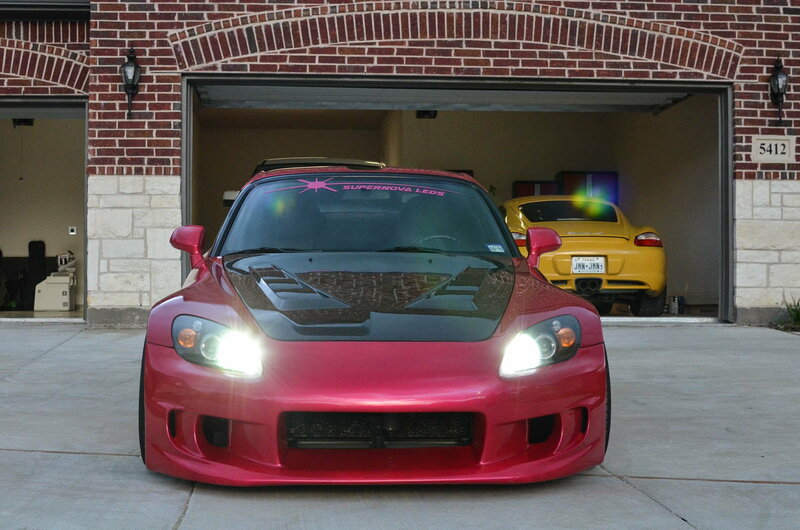 A: Yes, this works for all S2000s with or without DRLs. A: Yes, this will also work, but because the DRLs will be on when you're driving, the color changing light will only be visible when the car is off. Q: If I just want to upgrade the High Beam LED without getting the DRL functionality, how can I do that? A: See this product: Supernova LEDs High Beam Only (Pair) - $59.99 : JS2K.com! Supernova LEDs DRL + High Beam LED Headlights (Pair) - $119.99 : JS2K.com! High Beams Only - Only for 00-05 S2000s and S2000s without factory DRLs, AND you don't want DRLs. Supernova LEDs High Beam Only (Pair) - $59.99 : JS2K.com! Starts at a super reasonable $2.50. Thank you guys for your interest and support! Last edited by JS2k.com; 10-15-2018 at 02:17 PM. Is it illegal to have white signal markers and parking lights? Nope, sure isn't. The White ones are the same price as Amber. I'll send you payment, but I want a white set - not amber :-). thanks. Going to send payment tomorrow but I'm going to order everything in white, nothing amber. I'll include details to make sure in my notes via paypal. Thanks. Still waiting on your lit windscreens Joey. I thought the clear ones is illegal in some states, especially in socal. Okay, all PMs replied. I'll update the thread and respond to emails in a bit. I need to go to a meeting. Freaking work. Drowning in a flood of PMs and emails, replying as soon as I can.